James 315 puts awesome work in his effort to bring a permanent change into the life of highsec ice miners: to make them actually play the game instead of AFK-farming and botting. He bumps out of range or suicide ganks those who mine AFK or bot. His success would make some serious impact: players would actively mine. Think about the magnitude of that: he would actually fix mining in EVE! This would highly increase the cost of ice (there are less mining players than 24/7 bots) and would have huge effect on the EVE economy. All these systems need to be covered for the New Order to succeed to make a difference. Until they can effectively cover every single ice mining systems (maybe excluding a few that are in "highsec islands") the bots and the AFK-ers can just move next door. Also, their job can't end at collecting mining permits and making the miners change their Bio pledging their loyalty, they must be checked on to prevent them relapse into their bot-like behavior. 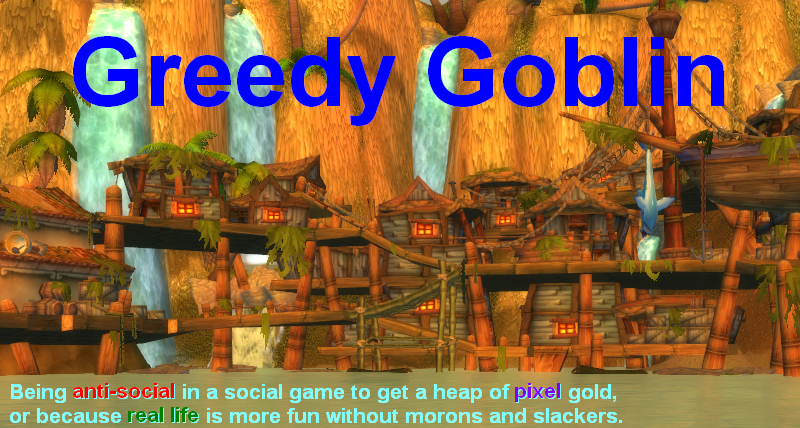 While "i haz honor" socials refuse to pay and change bio, a professional RMT sweatshop worker who runs 20 account semi-AFK mining wouldn't mind paying for peace. Without policing the paying ones this would be just another extortion scheme, probably the cheapest one (James would earn more money AFK-mining himself than doing this). For long, the crusade of James seemed nothing more than funny but irrelevant roleplaying that has local effect on other people. To have a permanent, global effect, lot of people have to spend lot of time in the ice fields patrolling and mostly waiting on a "criminal"! Seriously! Who the hell would be motivated to do that? In the linked post you can see that the miner refused to pay for "blackmail" and argued long with the agent of the New Order. He wasn't forced to change her mind. She did by realizing that her real enemies are the bots and AFK-ers. An active player is uncompetitive to a botter/AFK-er: she spends 100-200x more time mining the same amount of ore as the AFK-er just starts his beams and go AFK, spending a few seconds at the keyboard every hour. To earn money she must get rid of the bots and AFK-ers. This gave the answer to the "who the hell would spend lot of time in the ice field patrolling?" question: the miners of course. The miners themselves would be the self-motivated agents who fight for their own profit! They are already on the field with his Mackinaw(s), and could spend their time waiting for the cycle by looking for AFK/bots. A single miner could watch over the field. If an offender is identified, he can reship to a bumper ship. If the offender is repeating, he can call on the Knights to solve the problem permanently and relog to ganker alt too. This change would make mining an involving activity with constant action for profit! This would be like the Goon Gallente Ice interdiction, except it could run infinitely as the participants are self-motivated: every defeated bot is increasing his own income. It would practically be a PvP campaign ran by the active players against the AFK-ers/bots. This can be further enhanced by organizing the miners: several channels could be created for the Gallant Miners of 1-1 zone to socialize, organize themselves against bots, to form fleets with Orca boost, find partners for perfect refining, hauling to hubs, help newbie miners and so on. Due to war declaration problems the miners should stay in NPC corporations. Via channels they could still organize for common interest. The zones can be managed locally by either an elected official or a private investor who collects the mining permits of the zone and pays the local gankers/bumpers. Finally, after a critical mass is reached the system can be turned into full capitalist: the permit cost can be elevated seriously to pay for non-miner gankers, to place bounties on bots and so on. Please note that if the miner has a ganker alt, he practically pays himself, the cost would only be on those who just mine and don't participate in fighting off the bots! I think there is awful lot of potential in the New Order and would like to hear your opinion, especially if you are already involved. I've sent 2B stock money (support) to James 315 and started bumping non-compliant miners: I'm shocked. In just that one system there are like 100 ice miners on grid and only 2-3 active! Botting is beyond imagination! Enjoy before CCP makes bumping in highsec impossible. Was an interesting read. As a "Knight" myself, I see the biggest bottleneck to our growth being continued recruitment. We have a steady stream of newcomers now (about 1 or 2 everyday), but since we are all in different TZs, we can only effectively police 1 system (or a cluster of nearby systems) at a time. Alas the bots outnumber us greatly! That said, once we show up, its usually 24-48 hours before we totally clean house. I think going forward we have to put more thought behind recruitment, tailoring our message to highlight the boring nature of mining and the fun of pvp activity. Personally I joined the Knights as a learning opportunity to learn to gank! I think pretty soon we're going to see enough members to split into two separate units operating simultaneously. That's the goal anyway if we're going to dominate all of highsec. Yay, CCP to the rescue! But you do realise that no bumping would mean more ganks don't you? Agent Kainotomiu Ronuken here. Firstly, your bump ship looks good in concept, but EFT doesn't show agility, and I've never flown a tengu myself so I can judge. You might want to test it ingame before expecting it to work. A machariel or a SFI both do work, though. As for controlling all ice over all highsec, it is a pretty unrealistic goal in light of CCP's current stance on the matter (that is, any post relating to bumping on the forums is spam and will be treated as such), because it prevents us from really recruiting more supporters other than via advertising in the systems that we are already in. I believe that this is the reason our growth has considerably slowed recently, and also the reason for James' new initiatives such as ganking and moving system every week or so. Your idea about a miner-policed highsec would have merit, if it weren't for the fact that the New Order has discovered that miners are singularly unwilling to exert themselves, even to remove competition. You could possibly get permit-holders to report Code-violators to Agents, which would help, but with the exception of a few exemplaries they'd be very unlikely to take action themselves. If you want a pure bumber ship, use a regular Stabber. Goes 7324m/s (10760m/s overheated). If you want to go all out, hi-grade Slave set boosts it to 13422m/s overheated. Now thats a bumbing ship! If you were to donate 35billion. That would give you more then half of the current shareholder vote and a controlling interest in miner bumping. Then you would just need to convince James to put your ideas to a vote. As that would be an obvious move, if you split the donations between your Alts, you could cover your tracks a little. An alternate to that would be work out a deal with James where you and him decide what you want and put it to a vote, knowing full well that you control the majority of the vote. That way James can put things to a vote in an attempt to be transparent with his actions and you can both get what you want. As a frequent reading troll of minerbumping.com , the funniest eve-related website I have bumped upon (stupid joke, I know), I find their "project" commendable. Yes, I've seen that most miners can't fight for anything since they are AFK. However there are awful lot of new players who could be introduced to *PvP* via becoming a miner! There are awful lot of miner corps, eating up all the newbies. The New Order could beat them all (literally) and get the newbies for itself! They mine, earn ISK, look for targets and then relog ganker when find one. Yes, I know you use SFIs. My main problem with them (besides no skill to fly them while I already have Tengu) is that they can be killed by a few Tornados. While the SFI cost little, I'd miss my pod. It is extremely easy to get your pod out in Highsec. The align time for a pod is low and there are no bubbles. It is also about a week train to get Minmatar cruiser 4 for an SFI. A SFI is also a much less attractive target than a Tengu in highsec. In short, you should re-examine your reasoning here. Going against bots is fine, but their code is disgusting. "As Saviour of Highsec, I acted as proxy when electing myself Supreme Protector. Miners should respect the will exercised by the people when they made this choice." So he elected himself but it was the will of the people "that made this choice"? Are you kidding me? "Prejudice toward minorities is not permitted. For the sake of clarity, this cannot apply to all groups claiming minority status, but only discrete and insular minorities, which are defined as suicide gankers, Goons, and others who oppose highsec mining." Sorry if you are the target of predjudice because you don't belong to any of the arbitrarily chosen minorities. "To minimize the workload of our GMs, miners shall not file petitions against the Supreme Protector or his Agents. Failure to abide by this rule is an automatic Red Pen violation (see below)." Absolute immunity from those that he pretends to protect. "If a miner does not wish to purchase a mining indulgence, he may still be granted a one-day reprieve, if he is able to correctly answer the Supreme Protector's Questions Three." If you don't want to take part of his "service" you have to answer some question? "Gallant admits that he has no good reason for mining in highsec." Why not? Who makes that call? "Gallant promptly pays 10 million isk to the Supreme Protector of Halaima." "Gallant only takes as much ice as he needs." How much you need is subject to my will. "Gallant recognizes his place is at the bottom of the EVE hierarchy." Which gives me the right to extort them. Please, don't be Gallant either. "Most reasonable residents of highsec describe my leadership style as 'tough, but fair.'" Those who don't are not reasonable. "Q. Why are you in an NPC corp? Are you afraid of being wardecced? On the contrary, I am Invincible and am afraid of nothing. I do not need corp members to fight my battles for me, nor do I feel the need to hide behind a corporate veil. I will fight anyone at any time. However, creating a corporation does cost over a million isk, which would cut into my profit margin." Over a million! It's not like he extorts 10m per miner or made 100m in his other bumping campaign. Seems like he not only hides behind an NPC corp he claimed ownership of an unconquerable high sec system. Yeah, right. Since he is unable to controll everyone he wants the others to believe he CHOSE not to harm them while he was just not capable of doing anything. In order to challenge him I have to either waste a ship, answer probably stupid questions or work for him indefinitely? Now to the post you linked. "Code-compliant miners are the happiest, freest miners I know." As are "code-compliant" communists and North Koreans. Just look at their propa.. *cough* promotion videos and how they all smile! "Samui was most concerned about the "blackmail" in the Code. Obviously there isn't any. The Code is all about rewarding people for doing the right thing. We rescue them from the natural hazards of non-compliance, such as being bumped or killed." Extortion (also called blackmail*, shakedown, outwresting, and exaction) is a criminal offence of unlawfully obtaining money, property, or services from a person, entity, or institution, through coercion. Refraining from doing harm is sometimes euphemistically called protection. Extortion is commonly practiced by organized crime groups. The actual obtainment of money or property is not required to commit the offense. Making a threat of violence which refers to a requirement of a payment of money or property to halt future violence is sufficient to commit the offense. Exaction refers not only to extortion or the unlawful demanding and obtaining of something through force, but additionally, in its formal definition, means the infliction of something such as pain and suffering or making somebody endure something unpleasant. "Dana Skord > Like cutting off your electricity if you don't pay your power bill? Sir Tor Lorder > Like the electricy companay, we provide a service." With the difference that you pay your bills to get the service instead of paying to prevent harm. James sells you "protection" as a service and delivers the threat if you don't buy. That is the reason why the whole minerbumping project is an extortion scheme under the light of fighting bots. You are not AFK. Warp out if you get popped. 100MN SFIs are attractive in concept but terrible in practice. Speeds of more than 10km/s have a tendency to glitch completely through the target's hitbox. It is also incredibly inefficient in terms of capacitor and agility, so while you may (*may*) get a good bump if you don't glitch through them, you'll spend a long time recharging and realigning and you'll be completely unable to hit anybody who is orbiting. Fun ship, but ultimately useless. With this fit, you can achieve 4.5km/s while overheating, your capacitor lasts long enough to remove several ships from the mining zone, and you've got a decent tank. It costs about 70 million ISK. If you're worried about losing a ship, have you considered a Machariel? You can easily reach 100k EHP and 3000m/s with the right fit, and it works well for bumping clusters and orcas and things. I'd be interested to see the effect on our recruiting we could have if we did something to do with newbies. As it is, the Order doesn't really have any structured recruiting (or anything) system, but we might be reaching the point where that should change. You should consider contacting myself or James or another Agent ingame if you want to discuss this more. You can't sell them protection from yourself. You could sell them bot removal as a service that THEY can CHOOSE to buy or not. The problem is that you can't reliably prove if someone is a bot. You would need to extend it to competition removal which offers no solution as botters could buy the service themselves and you couldn't touch them. Even the removal of high sec isn't a solution. It would open up space for others to rent out to miners, but botters could buy permission, hide somewhere or calculate the risk. The underlying problem here is that mining can be AFK'd/ botted. Fixing this admittedly hard to fix problem is my eyes the ONLY rational solution to get rid of botters. Others involve extortion (James), social repression (keeping your honor), or providing protection for the botters as well. If you have whines about the Code, post them on the EVE-O forums. We love publicity. I doubt that Gevlon, who is famously anti-social, is interested in the morality of the thing, though. In Eve currently, there are perfect substitutes (any white glaze is equivalent to any other white glaze) and near-perfect substitutes (if you're really interested in heavy water, you can easily switch from one variety to another with some loss in yield). Further up the chain, there are near-perfect complements (if X and Y are both needed in a certain ratio to make Z, and making Z is the only or primary thing X and Y are useful for, then they are complements). The problem that Eve (and realistic-economy MMOs generally) have is liquidity. Ideally for fun, you want many markets, each moderately deep. CCP wants to steer between the Scylla of too few markets and the Charybdis of too thin markets. You can imagine CCP starting with just one good "Ice", and then deciding that is too few markets, and deciding to fracture it into different non-substitutable goods, then deciding that makes the markets too thin, and deciding to make the goods somewhat substitutable. Currently, this goods substitutability/ complementarity structure is hard-coded by CCP. However, it would be better if it changed dynamically according to the number of buyers / sellers in a market. At first the major risk is thin markets, so it would start simple. Then once there is some liquidity, it would fragment into subvarieties specialized for different purposes. Relationship-specific investments would be something like "a factory specialized to inputs in XYZ format" or "an ice-mining module producing ice in XYZ format", where XYZ is a standard like metric/imperial measurements, AC/DC power, 100/220v power. The intent is that the space of possible formats is huge - like the space of corporation names or emblems. A cartel could pick some format, build modules that mine ice in that format, build factories that expect ice in that format, and gain a slight bonus (compatible format) in trading with itself. Then it could bump or gank or put bounties on miners mining in a competing format. The miner bumpers cannot gain a monopoly on ice in general, and a monopoly on one variant of ice would be both difficult and probably not profitable (because CCP makes different kinds of ice fairly intersubstitable). In the real world they would split off a new variant of ice (creating a new market) and then try to advocate for that variant and grow the market while retaining near-monopoly power over it. What I'm trying to say is that relatively standard moves in the real economy (e.g. embrace and extend) depend on being able to create new kinds of goods and therefore new markets, even if they're in many ways only slight variants of existing goods. Welcome to the New Order Gevlon, quite a few of us are actually miners and industrialists who are fed up with seeing our efforts devalued by the hordes of non compliant miners & bots. As other agents have said the Stabber is an excellent ship for bumping, and the Catalyst is our choice for explosive miner removal. If you're worried about losing implants& clones then your best bet is to join Estel Arador for 24 hours and install a couple of jump clones, without implants, to use for your bumping activities. Disregard my earlier comments about SFI. I was unaware you were doing this on your main. You're an obvious target to some so the tank is probably worth it. I know PL uses a combat fit bump Machariel but do not know the fit for it. @ "I am making a mental note..."
You won't get any further than a mental note. Promise. Kainotomiu Ronuken: "I doubt that Gevlon, who is famously anti-social, is interested in the morality of the thing, though." You seem to confuse asociality with anti-sociality and mix in morality, not a good starting point. Casanunda: " [...] who are fed up with seeing our efforts devalued by the hordes of non compliant miners & bots. [...]"
As I said getting rid of bots is a good cause, but what gives you the right to force anyone to comply to your arbitrary rules? If you would own that space, you could establish rules and rent it out, but you don't. You are just a bunch of savages, hiding in a zone without threat and selling protection from yourselves. The New Order of Highsec DOES control the systems we operate in. The first thing we do when we arrive is lay claim to the system and inform the miners therein that they are now subject to the New Halaima Code of Conduct. In every case the result is the same. Open defiance, mocking, space lawyering and calls for someone (someone else of course) to wardec, gank, petition, anti-bump or otherwise engage in futile anti New Order activity. Then the bumps and the sight of exploding Mackinaws brings them to recognize the awful truth. We DO decide who can and who cannot mine in our systems. We DO ignore the efforts of both the miners and CONCORD to stop us. We DO have the will, the means, and the ability to do what we say we do. And all we ask is that the miners follow the New Halaima Code of Conduct. For their own good. Bing Bangboom: "The New Order of Highsec DOES control the systems we operate in. The first thing we do when we arrive is lay claim to the system and inform the miners therein that they are now subject to the New Halaima Code of Conduct." Exactly. You go there and tout that your rules now apply there. No one can kick you out because it belongs to no one. Any action summons Concord and is therefore a waste of time. "And all we ask is that the miners follow the New Halaima Code of Conduct. For their own good." Where "all" includes paying 10m ransom and responding everytime one of you asks for it. Who gives you the right to force them towards their own good? Spot on. Or else you harass them until they move or comply. Face it. You offer "service" at gun-point. But nice propaganda talk there. quoting Camo "but what gives you the right to force anyone to comply to your arbitrary rules? If you would own that space, you could establish rules and rent it out, but you don't." We have the right to force people to comply because Eve is a sandbox, we have access to exactly the same tools and mechanics as any other Eve player, we just choose to utilise them in a particular fashion. 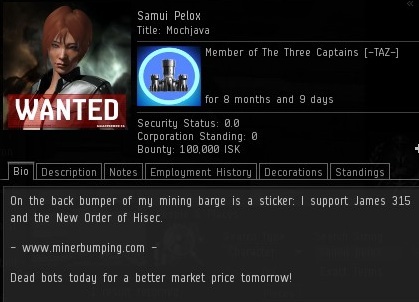 With the way that we apply the tools CCP has given to each and every player we can and do lock down entire systems when it comes to mining, technically while we may not own said system (because there is no sov in hisec)we do in fact control it and because we control it we can rent out annual mining rights for the measly sum of 10 million isk, simply put if we're in control of the system and a miner doesn't have a permit, we will remove their ships and prevent them from mining by using the tools provided by CCP, namely suicide ganks and bumping. Don't like the way we do business? move somewhere that we aren't, simple. I've been an active reader of your blog for a few years now, I'm both a WoW and EVE player (well, I'm not playing WoW anymore since before the pandas arrived). I think that this post showed a different goblin from the one I knew (or pretended to know) before. My point is that reading through the chat screenies you looked like having a lot of fun!! I'm pretty sure you had fun doing other things in both WoW and EVE before, but the feeling is that bumping barges and making bold statements in local about it actually gave you a lot of amusement. I mean, Gevlon speaking with RP mode on? Never seen it before!!! You've succesfully beated up bots and M&S in the market game, no doubt about it, but may it be that beating them "phisically" (bumping them or eventually ganking them) would give you more fun? For those used to be driven through a game, like it happens in all other MMOs, EVE might be a challanging game, you have to find your own way, you have to define your own goals since the game itself doesn't give you more that a few, sometimes misleading, advices when you start playing it. I really hope you have found your way as reading your blog posts about EVE is one of the first things I do every day along with reading MinerBumping (you guys are making such a great job!!!). Personally, I think that having both Gevlon and James315 working togheter can only bring huge and positive changes in a dieing high sec!! All hail Gevlon and James315. You may say you've been saved by the Saviour of High Sec!! "what gives you the right to force anyone to comply to your arbitrary rules?" In the lawless galaxy of New Eden your cannons are your rights. If you can force someone to do something and get away with it - you have the right to do so. If someone can force everyone in a system to live by his rules - he owns it. That, if you hadn't noticed before, is the main EVE selling point. I recall even some videos made by CCP about it. Shame you missed them. Alkarasu: "In the lawless galaxy of New Eden your cannons are your rights. If you can force someone to do something and get away with it - you have the right to do so. If someone can force everyone in a system to live by his rules - he owns it. That, if you hadn't noticed before, is the main EVE selling point. I recall even some videos made by CCP about it. Shame you missed them." As Casanunda pointed out, everyone can suicide gank and bump miners. So everyone owns highsec? There is no shame at all since I'm not really interested in internet space ships but the philosophical questions and EVE is a mere canvas for that. Rights. There is no law, that can force you otherwise, therefore, if you can do it, you have the right to do it. Situations, where CCP call something an exploit, breach in EULA, and pulls out banhammer are very rare (and, in most cases, involve something from the real world, like bots). "everyone can suicide gank and bump miners. So everyone owns highsec?" Everyone have the right to own hisec. Whether you use your right or not - is completely different question. Alkarasu: "Rights. There is no law, that can force you otherwise, therefore, if you can do it, you have the right to do it." Take some guns, go to lawless black Africa and kill people. You have the right to. "Take some guns, go to lawless black Africa and kill people. You have the right to." I think you deliberately missing the point that "I have right to do it" not always equals "I will do it", "I want to do it", or even "I think it's right thing to do". Considering how old and stupid this mistake is, your hope, that someone will fall for it, is very sad thing to see. You have found a calling Gevlon! Go forth and cleans the galaxy of Bots and pitiful wretches that would turn themselves into bots. Kainotomiu Ronuken: My mning alt, Jethro Campbell, mines and has done some bumping as well. And there are some folks running the Eve University mining fleets that have been known to shoot AFKers in their own fleets ... you might want to get into E-Uni's public mumble and talk to them ... they might even be interested in setting up a Lecture session for you, or even help. Eve is a game. Lawless third world countries are real. If you feel some folks are playing Eve a bit too rough for you, you can either play rougher, play somewhere else in Eve, or play WoW. Comparing non-consensual PvP ( but within the EULA! ) to human rights violations in some lawless third world region is fatuous at best.